GERMANY: Winergy's gearbox for the 8MW Adwen offshore turbine is the largest and, in terms of input torque, the most highly rated yet seen. Eize de Vries was granted exclusive access to the unit and its production facilities ahead of its unveiling at WindEnergy Hamburg on 27 September. 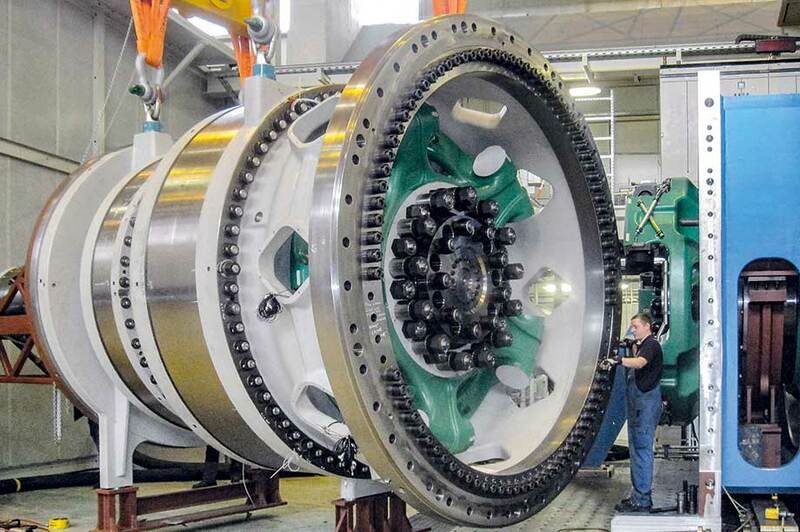 A fully completed planetary gearbox stands in one of the large production halls at Winergy's manufacturing plant in Voerde, North Rhine-Westphalia. Nearly four metres long, 3.3 metres wide and 3.7 metres high, it is an imposing sight. 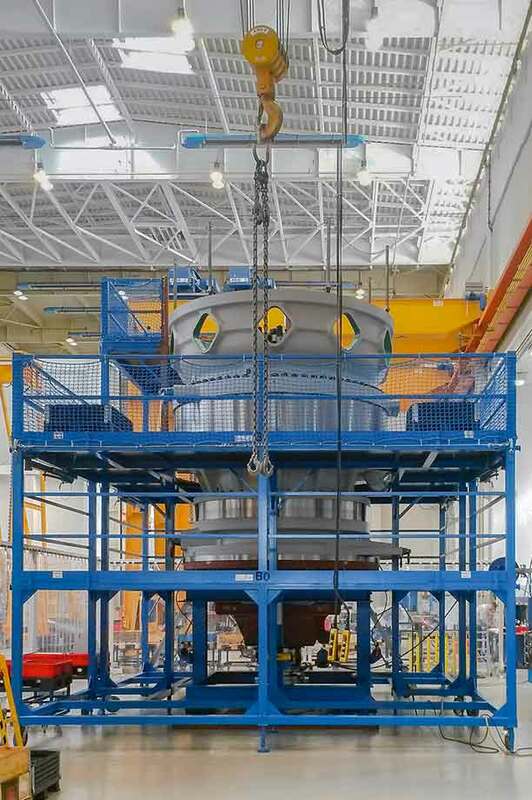 Next to it, another unit is taking shape according to the company's standard vertical-assembly process. This starts with building the smaller, medium-speed, second stage from various individual components, followed by the much larger low-speed first stage, and finishing with the fitment of the low-speed coupling and a 15-tonne cast protective cover with mounting flange to the main shaft housing (see Geared drivetrain section, below). A five-metre scaffolding structure with three working levels is built around each structure during assembly. "This is one of the main differences to the assembly of our smaller-volume gearboxes, which, to a large degree, is done by technicians working at floor level," says Andreas Klein, Winergy's vice-president for engineering. "But to work on the assembly of this gearbox, technicians require a health certificate declaring that they are in good health and capable of working at height. Essentially, we had to rethink the entire assembly process due to the size increment, and there were additional needs for new tooling, safety devices, and different ways of handling individual components and finished gearboxes," he says. In a separate adjoining area, various completed gearbox components are awaiting further integration and pre-assembly. Each has its own specific scaling demands and challenges, explains Klein. "In essence, this new gearbox is the outcome of a continuous technology development process, and therefore a mix of proven principles and concepts, as well as necessary innovative solutions being introduced," he says. "Adwen's specified operating parameters, performance envelope and recommended factors, combined with Winergy's proven solutions, has created a best-in-class drivetrain platform for now and for future scalability." To reinforce the point, Klein focuses attention on three of the main components of the low-speed gear stage: the ring gear, characterised by its inward-facing teeth and a diameter of more than three metres; the planet wheel carrier; and four matching planet gears. 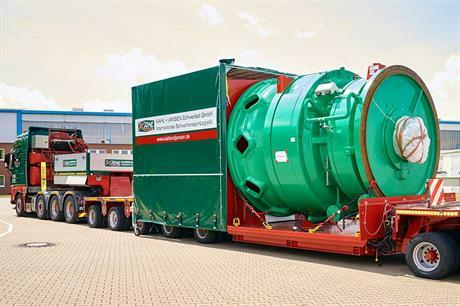 The largest gearboxes Winergy made before the Adwen unit were for 6MW offshore turbines, which incorporate a ring gear with a diameter of about 2.6 metres. This was considered the maximum size for large-series manufacturing at an acceptable cost while at the same time maintaining high production quality and process stability. "It took one year to develop the specified Adwen gearbox in two versions," says Klein. "The first comes with conventional roller-type bearings, while the sister version — fitted with journal bearings in planet wheel bearing positions — will also become available in the future. "The low-speed stage ring-gear size increment step could only be accomplished through major combined engineering efforts in multiple areas, including team work with Adwen experts to ensure the gearbox provides the best performance as an integral part of the complete drivetrain. These include — besides retaining unchanged product quality — implementing the latest advances in gear heat treatment, and in ensuring overall process stability." Winergy's casting requirements and Adwen's in-house safety factors for the planet-gear carrier represented another stern challenge. According to Klein, there are few foundries that can meet these stringent demands. The single biggest challenge for the design team was perhaps that this major scaling exercise had to cover all relevant areas without omitting any essential variables. "The full understanding of non-linear scaling rules and processes proved particularly complex, as did coping with many other, often only partly known variables, including those required from external suppliers," he says. "If, for instance, we ask three bearing suppliers about the stiffness of a specific bearing type, they all provide different figures." Another design issue was that smaller gearboxes are typically designed as stiff as possible, but pursuing such a development strategy for the AD 8-180 gearbox would have resulted in a major mass penalty. The main impacting factor is that the nominal gearbox input torque has almost doubled in value compared with a state-of-the-art 6MW gearbox, while many other design variables and specifications were also new and of a totally different scale. "We therefore decided to commence with dedicated research aimed at better understanding materials behaviour, and, in parallel, accepting higher gearbox design flexibility." These combined efforts, together with Adwen's established optimal speed and torque of the full drivetrain, resulted in a favourable gearbox mass. "The gearbox has almost double the nominal torque capacity, with only 20% more weight than gearboxes used in 6MW-plus turbines," says Klein. A conventional design approach focused on retaining maximum stiffness would, by contrast, have roughly doubled gearbox mass for similar input torque (kg/MNm). During my visit, an AD 8-180 gearbox was undergoing cold-climate tests in Winergy's large new climate chamber. "The entire chamber structure can slide on a rail system, which allows us to easily move it sideways for hoisting a gearbox in for testing," says Klein. "Inside the chamber we can simulate operating temperatures between +25C to -40C, but for European offshore projects only up to -10C is required. A full climate test normally takes several weeks. In practice, each turbine supplier has its own specific procedures and starting-up strategy from non-operating low-temperature conditions to full operation." A common general procedure is to first heat up the lubrication oil in a separate oil tank and the gearbox oil sump to +10C. When starting up, the friction losses inside the gearbox are used to heat up the oil quicker, and, once this temperature is high enough, rotor speed is raised in small, pre-determined steps. Also turbine load is then applied and increased gradually. Winergy's modified 14MW test bench is now being used for back-to-back testing of AD 8-180 gearboxes with up to 125% over-loading. Perhaps one of the most impressive details inside the testing facility was the set of opposing gearbox mounting flanges, with their diameter a true indication of the massive scale of these new gearboxes. Adwen's demanding validation process requires back-to-back tests in order to guarantee maximum reliability of such a critical component. Nearby, in the same hall, the concrete floor for a new 17MW gearbox testing facility — 50 metres long and 15 metres wide — will be cast this summer. The test bench will become fully operational by mid-2017, and include a 6MW cooling unit for the heat generated by two gearboxes and all electrical equipment required for the testing. "However, this is only the first step," says Klein. "The foundation and other civil structures have been laid out for 35MW already." Adwen's AD 8-180 turbine holds at least three different size and rating records. 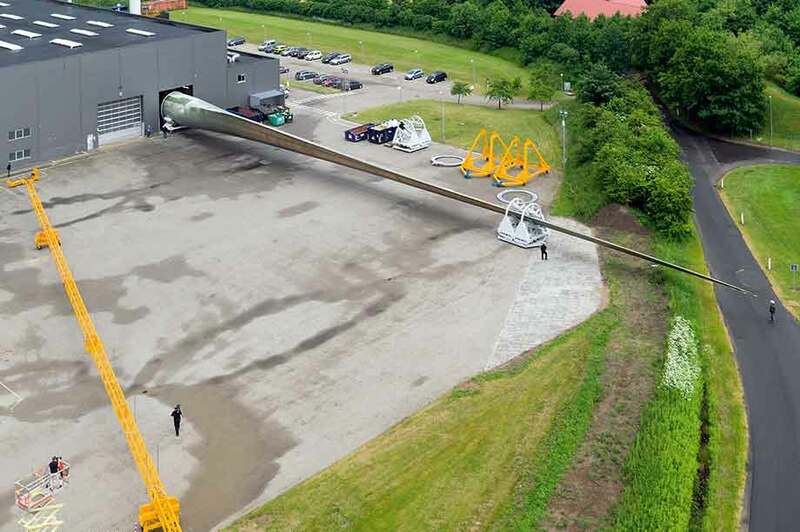 The first is the 180-metre rotor diameter, the second a matching 88.4-metre rotor blade (below), and the third is for the new gearbox with a rated 9.9MNm input torque. The AD 8-180 represents the first major model of a new platform, according to Adwen's chief technical officer, Maite Basurto. The turbine for high-wind application is characterised by a comparatively low specific power rating of 314W/m2. If Adwen does indeed decide to upgrade the platform in future, Winergy's new dedicated gearbox design seems to hold the potential in becoming one of the main enablers in making such steps possible and feasible. There are significant conceptual differences between the AD 8-180 drivetrain and conventional non-integrated geared drivetrains. "These latter concepts feature a three or four-point gearbox support and always incorporate a torque arm at each side," says Adwen CTO Maite Basurto. "The AD 8-180 has a two-point gearbox support, which eliminates torque arms supporting it to the main chassis. Main components are further individual drive-system elements, joined by circular bolted flange connections, and together form a tube-shape assembly," she says. Viewed from the rotor side, the rotor hub is connected to the main shaft, in turn supported by two preloaded taper-roller bearings. The shaft and bearings are together incorporated in a cast main shaft housing with horizontal mounting flanges for bolting to the cast main carrier, creating a structurally strong, stiff assembly. "In non-integrated drivetrain support solutions, the necessary degree of system flexibility is provided through torque supports usually fitted with elastomer elements. "In our solution, the main shaft is connected to the gearbox via an adaptive low-speed elastomer-type-hydraulic coupling providing such flexibility. It has high stiffness properties when transmitting rotor torque, and low stiffness behaviour to non-torque bending loads." The second AD 8-180 drivetrain clutch is a torque-limiting device in the generator's output shaft. The two couplings protect and isolate the gearbox from negative impacts caused by rotor and grid (fault) induced peak loads, rotor bending moments and structural housing deformation. Since 2013, a limited number of Winergy high-speed onshore gearboxes with journal bearings have been operating in multi-megawatt class turbines. Klein expects this total will increase to about 35 units by mid-2017. "Because the technology is new for the wind industry, we decided on a step-by-step approach. Really encouraging is that of all 2015's top-ten turbine suppliers, except two producing direct-drive units, we are talking with seven of the remaining eight. We also review options for journal bearings as a retrofit solution in gearbox planetary stages."